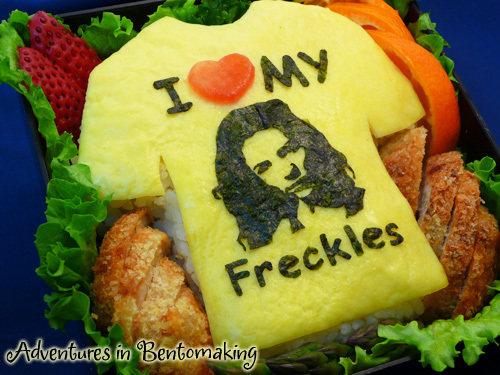 When I came up with the idea for this bento earlier in the week, I immediately regretted using yellow omelet to be the blank slate for Ben Linus last week. It seemed really redundant to use yellow omelet two weeks in a row. This little annoyance aside, I wanted to do this one anyway because tonight is presumably the night that we get to see Kate and Sawyer back together again. The Constant remains my hands-down favorite episode because Desmond sobbing “I love you, Penny! I’ve always loved you!” into the phone just makes me up the stock of Kleenex, but Kate and Sawyer’s goodbye is way up there in my favorite Lost scenes. 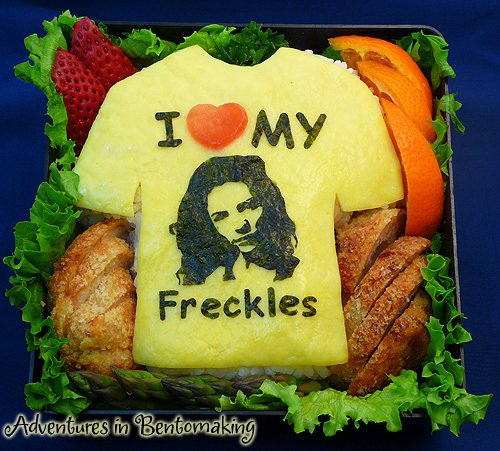 Today’s Lost themed bento contains a t-shirt for Sawyer. This makes me certifiably insane because who the hell wants Sawyer to wear a shirt? Mr. Pikko felt this was a little too obscure, but hopefully people get this. Of the many things that stand out during Lost episodes, Hurley’s frantic purchase of a bright yellow “I Heart My Shih-Tzu” shirt is definitely one of the most memorable this season. We can just pretend that Hurley brought this back to the island for Sawyer. Read on to see how I made this. As I like to keep reminding people, I’m horrible at cooking eggs, so when I asked Erika to translate some pages in my Japanese bento book that used some beautiful yellow stuff that looked like dough, I was really upset to find out that it was a really thin egg omelet. Eggs sticking to pans is my worst nightmare and happens pretty much all the time, so I was terrified. My cousin Jenn bought me this egg scraper for my pans and I swear I use that poor guy every time I cook eggs. Still, using some online research and Erika’s translation, I was able to figure out how to make this, which was to beat the living heck out of an egg, add a cornstarch solution and some water, then put it through a sieve to get the bubbles out, then cook it in a lightly oiled pan, covered on low heat. I executed my first egg by going AFK to watch Law & Order while I cut out Kate’s face, but my second one came out okay. This was good as I was expecting to use up at least 5 eggs and pull out all my hair before getting a working omelet. 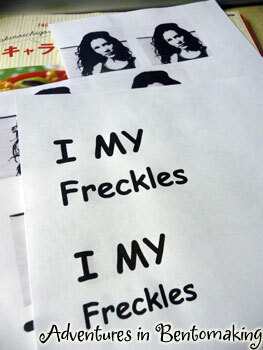 I used printouts again for cutting out Kate. The font is Comic Sans, which I despise, but that’s what the shirt looked like it used. The picture was one that I asked my Allakhazam co-worker Vlorsutes to convert for me since he’s our resident XI graphics guy. Even with an image this clear though, cutting her out was horribly hard. I ended up using up about 8 pictures before I finally got it right. Doubling the nori up seemed to help a lot, especially since that meant I’d have two versions to pick from once I was done cutting. I printed out a picture of a t-shirt and cut that out to cut the omelet into the shirt shape. 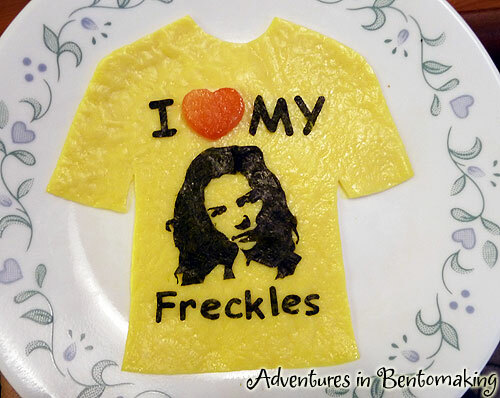 With the cornstarch, it cut really nicely and I was really happy with how easy it was. Using a tweezer, I added the nori pieces one at a time. The red heart is made out of strawberry and cut with a food cutter. I used the same box as my Ben Bento, adding green leaf lettuce first. After that I added a rice t-shirt, which I formed by hand on a plate before transferring over. It is a thin shirt so that it’s not too much rice and the food ended up being too tall, so I took the shirt out and added some asparagus support beams. This did the job perfectly as it raised my rice shirt up just enough to be level with the top of the box. Since I’m planning to experiment with the Cordon Bleu Bites again, I figured I had better eat it all up fast, so I used the meatballs again. 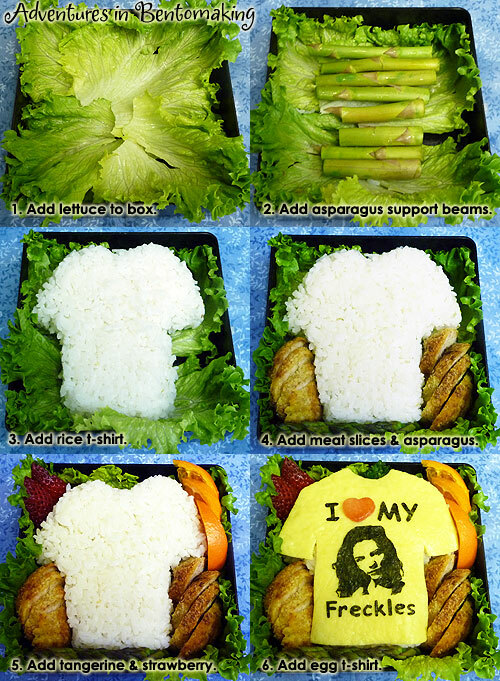 I warmed them up and sliced them, adding them to both sides of the rice shirt. I microwaved some asparagus for about 15 seconds and added it to the bottom of the box. Next, I added three tangerine slices to the top right, two strawberry quarters, and a piece of parsley in the neck area to fill a space. For the last step, I simply laid the yellow shirt down on top of the rice shirt. Voila! It’s funny how things end up working out. Last Friday I just so happened to Google “Lost Extra” again and an article dated February 27, 2009 came up with a name and address to send your picture and resume to for becoming an extra on Lost. I’ll definitely have to send something in! Enjoy the show tonight! Will Sawyer run to her and begin making out right there Saul Tigh style, Jack-standing-right-there be damned? She hasn’t seen him in three years, he’s only been missing her like a week. That’s messed up!